This VMAXTANKS battery is like all the other batteries from the VMAXTANKS, which consists of wide range of precise features. The VMAX857 AGM Battery has dimensions 7.7 inches by 5 inches by 6.1 inches and it weighs only 25 pounds, which makes is extremely small in size and easily transportable. This battery is designed especially for deep cycle purpose and it is a very good choice for those who require a reliable and small size group U1 deep cycle battery for powering up the onboard vehicle or marine unit accessories. This VMAXTANK battery has 35 AH capacity, 75 minutes capacity and 300 A CCA, which makes it an average powered battery good for small boats and vehicles. AGM technology that makes it a reliable and maintenance free battery. 12 volts with 35 AH rating and 75 minutes reserve capacity. No dangerous gas or flammable fumes leaking risk and it is completely spill proof. This battery has CCA of 300 A and MCA of 390 A; it can be used even in cold climatic condition. It is approved for mobile, maritime and even for air travel, which increases the utility option of this battery even more. The plates are manufactured from the special custom built military grade alloys, which gives those special physical as well as chemical structures. The battery is constructed in a manner that it is resistant to extreme vibration, heat and harsh weather conditions. It can be charged by smart charger or microprocessor controlled charger. 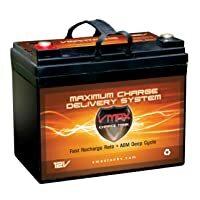 This VMAXTANKS battery offers maximum power density and fantastic deep cycle capability. Approximately 4 to 5 hours of running time with 50% to 60% depth of discharge when used on trolling motors. This battery is also resistant to heavy shocks. No operating temperature limit as it he battery is weather proof. Long service life of at least 8 to 10 years, making it a very long lasting marine battery. The VMAX857 AGM Battery is applicable for deep cycle purposes. It is a perfect choice for those who have small boats and less room for a battery to run some onboard accessories like trolling motors. It best suits for small boats and ideal for 18 to 35 lb Minn Kota, cobra, sevylor and other trolling motors that require a 12 volt battery with 35 AH capacity or less, belonging to group U1. It offers good thrust performance and it can be used in all weather situations, without any utility limit. VMAXTANKS batteries are best known for their long durability and the capability to recover from deep discharges. In the AGM design of this battery, no silica gel or other contaminants were used, due to which the battery is able to offer high performance as the mate is completely able to absorb the electrolyte. No excessive gases are able to accumulate inside the battery as this battery has been designed with safety release valves with automatic reseal feature. The self discharge rate of the VMAX857 AGM Battery is around 1% to 2% per month, which makes it superior as compared to 2% to 3% self discharge rate of other standard deep cycle batteries. The rugged construction and unique sealing technology of this battery guarantee leak proof operation and mounting ability at any position without causing any effect to the function and durability of the battery. The ultra strong ABS container of the battery reduces issues of case bulging and plate warping, which ensures high performance and enhanced durability. The main heart of this battery lies in the plates of the battery, which has been designed and manufactured using special treatment and technology that gives them distinct physical and chemical structure than the other lead-calcium plates. One important drawback of this battery is that it is applicable only for deep cycle purpose and strictly recommended not to be used for cranking purposes. Only an AGM smart charger must be used for charging this battery and in case a wet battery charger is used, it might cause permanent damage to this battery. It is only suitable for 18 to 35 lb trolling motors and might not be that powerful for running trolling motors with greater weight. This battery is a very reliable deep cycle battery and nothing can replace it on its specialization and applications; it is affordable in quite a good deal.